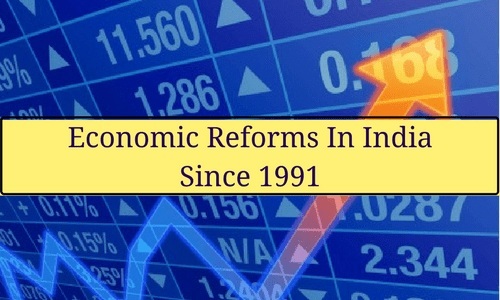 Economic Reforms can be defined as the introduction of new Economic policy by the government since 1991 to cope with the economic crisis and to accelerate the rate of economic growth. It consists of LPG i.e. Liberalisation, Privatisation and Globalisation. Rise in Balance of payments. NOTE: Balance of payments is the difference between total exports and imports of a country. To create a more competitive environment in the economy to improve the productivity and efficiency of the system. It means to free the economy from direct or physical controls imposed by the Government. a. Initially, the interest rates were determined by RBI but now all commercial banks are made free to decide their interest rate independently. b. Indian industries are made free to import machines and raw materials from foreign countries. c. Industries are made free to diversify their production capacities and reduce the cost of production. d. Restrictive trade practices have been abolished. Earlier, companies having assets worth Rs. 100cr or more were called MRTP (Monopolies and Restrictive Trade Practices Act 1969) and were subjected to several restrictions. But now they are free to take the investment decision. e. Industrial Licensing and Registration has been abolished and now private sectors are free from Licensing and other restrictions. Privatisation means allowing the private sector to set up industries which were earlier reserved for the public sector. It also includes the selling of PSUs to the private sector. a. Selling of shares of PSUs to the public and financial institution. From 45% to 55% shares have been increased for Private sector. b. The Government has started selling out those PSUs which were in loss. c. Number of industries reserved for the public sector has been reduced from 17 to 3. Globalisation means interaction Global economy i.e. interaction of the domestic economy with the foreign economy with regard to foreign investment, trade, production and financial matters. a. To make the economy of India attractive, customs duties and traffics imposed on imports and exports are reduced gradually. b. Longer duration trade policy has been enforced i.e. liberal policy has been adopted, all controls on the foreign trade have been removed and open competition has been encouraged. c. Convertibility of Rupee has been introduced.